The 5-Hour Energy drink is a popular energy supplement that comes in a small 2 oz. container. It differs from other energy drinks in that it contains no net carbs or sugar and only a small amount of caffeine. This product contains a blend of several ingredients, some of which include B-vitamins, amino acids and caffeine. These drinks contain a blend of several stimulating ingredients that account for the bulk of its energizing effects. Chief among these is caffeine, though it is present in smaller amounts than most other energy drinks. According to the 5-Hour Energy Website, the original formula contains roughly as much caffeine as one cup of coffee. Also present in 5-Hour Energy is citicoline—a naturally occurring psychostimulant. According to the National Institutes of Health, citicoline protects against cerebral damage following stroke and hypoxia and improves memory in aging animals. Citicoline may also promote healthy brain function in patients with Alzheimers disease, Parkinson's disease, drug addiction and glaucoma. 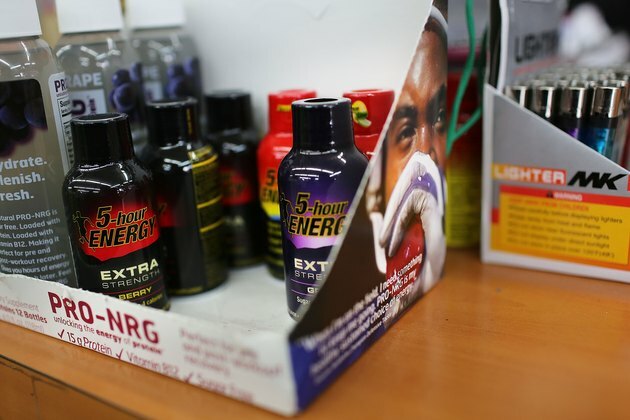 The 5-Hour Energy product contains several other naturally-occurring compounds, such as glucuronolactone and malic acid, both of which play a role in energy production. Other ingredients include the amino acids tyrosine, phenylalanine and taurine--a cysteine derivative. Also known as niacin, vitamin B3 is one of the key ingredients in 5-Hour Energy products. According to E Med TV, niacin is an extremely effective remedy for high cholesterol. It increases production of “good” HDL cholesterol, while lowering levels of "bad" LDL cholesterol shown to clog arteries and increase the risk for heart disease. A phenomenon known as niacin flush may occur when taking niacin-containing products like 5-Hour Energy. While harmless, niacin flush may be extremely uncomfortable and can include symptoms like facial flushing, sweating, itching, dizziness and skin tingling. This product includes a warning on the label regarding niacin flush and how to prevent it. B12 (cobalamin) is another B-complex vitamin found in 5-Hour Energy drinks. It is involved in the production of amino acids and red blood cells and is needed for carbohydrate metabolism--a process responsible for energy production. It also helps with nerve formation and creation of cellular DNA. B12 works with other B-vitamins vitamins to metabolize nutrients, produce neurotransmitters in the brain and provide energy for the body. According to Medline Plus, a deficiency of B12 can lead to depression, fatigue, shortness of breath and anxiety. Other vitamins in 5-Hour Energy include folic acid and B6. One of the advertised benefits of 5-Hour Energy is that it contains no sugar or net carbs. Instead, 5-Hour Energy contains sucralose, an artificial sweetener that is approximately 600 times sweeter than sugar. Sucralose belongs to a group of chemicals known as organochlorides, some of which are poisonous to plants and animals. However, sucralose is generally considered safe for human consumption and has not been shown to accumulate in the body and cause toxicity like other chemicals from this group. The 5-Hour Energy drink contains the preservatives sodium benzoate and potassium sorbate, which are added to prevent spoiling and maintain freshness. Other ingredients include glycerin, purified water and natural flavors. Can Energy Drinks Make You Sick?